WELCOME TO THE 5TH ANNUAL MMHB !!! Going into the final stretch, so I though I'd post my second to last one. 2.) Myra for A3 Character Morph. Registration Required. 3.) Dulcy Character for Aiko 3 Texture Only. Registration Required. 4.) Up Puff Hair for V3 and V4 Registration Required. 5.) Tink Dress for Aiko 3 5th Row, 3rd Item. 6.) Corsetry for Free Tink Dress for A3 and V4 Registration Required. 7.) Universal Wings 2 Registration Required. 8.) V.2Dark Flyer for Thorne Universal Wings 2 Registration Required. 9.) Mic Old Style Registration Required. 10.) The Mad Albino Skin Texture for Goblins. Registration Required. 12.) Musical Instruments Top Link on Right. 14.) Lantern 3rd Row, 2nd Item. 15.) Bone Throne 2nd Row, 2nd Item. 16.) Neck Ring Registration Required. 17.) 10ft Easy Pose Chain Registration Required. Missing In Action: Goblin Wings (a Christmas Give-A-Way from the Rock Fairy Set). Paid For: Michael 3 Reduced Resolution. 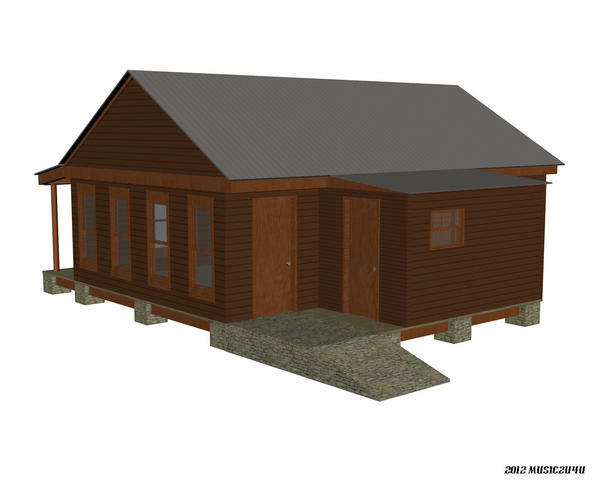 As always, figure set-up in Studio 2.3 with final render in Bryce 5.5. No postwork save for addition of signature and copyright notice. These are some jammin' demons! I like it! So, what do those stone gargoyles get up to when we're not looking? A charming scene! Question: Since sources aren't mentioned (that I've been able to pick out), do the masonry, forest, & sky derive from Bryce wizardry? Well, I finally have my piece finished and rendered. I kind of maxed out my computer's capabilities on this one. Marc and Maria, and the rest of the crew, take baby Chris out on his first Halloween Trick or Treat. Well, there's nothing like family night out! :lol: Good job! Oh, my word! What a lot going on! The sky was indeed done in Bryce. It was a free setting I picked up somewhere along the line who knows how long ago. All the little pedestals and risers are just Bryce primitives with textures. The forest is the biggest cheat, it's just several 2D flats positioned one behind the other. There may be one or two native Bryce trees in the foreground, but the rest are fakes. My final entry will really push this idea to the limit...maybe too far! Well, here's my picture....might feel a little familiar. Castellan, if this is an entry...there must be links to all your freebies. They must be working links so others can get the stuff. I can not accept this without them. Also, there must be a musical instrument or item in the render for it to qualify. For now, it will be a NAE. (not an entry). 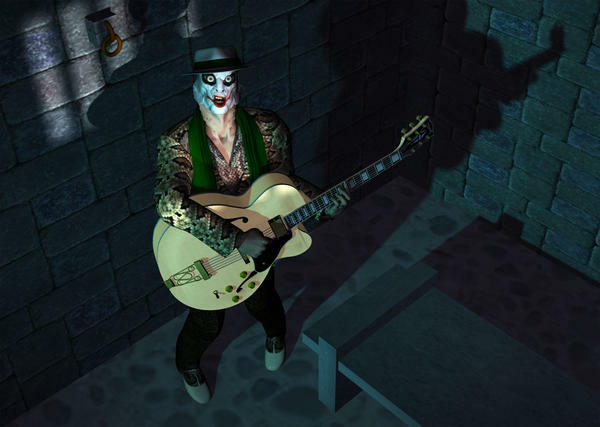 Put your links with the listings, and a musical instrument with a link to it, and I will accept it as an entry. Funny Tramp! I guess the poster will work for the musical item. That's a new move! Usually always an actual model, but this is fine. check your pm box for some nice gifts. This is a cool render, I hope you decide to put in the links to the freebies and something music related so it can be an official entry! It could be a jukebox or radio, there are a few of them around...especially at ShareCG. There's a radio that is old fashioned that would probably be a good fit for the props you already have there. Not to change the subject or anything but Rob I sent you a PM. Jeeperz, I have a freebie if you want it. 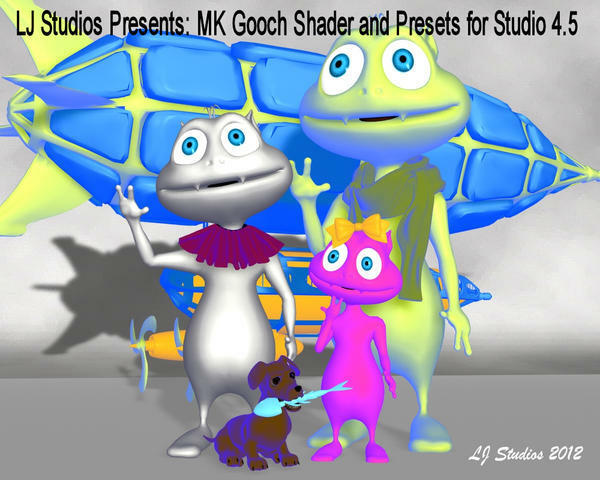 LJ Studios' MKGooch shader and presets. There is a Gooch shader and 16 presets. 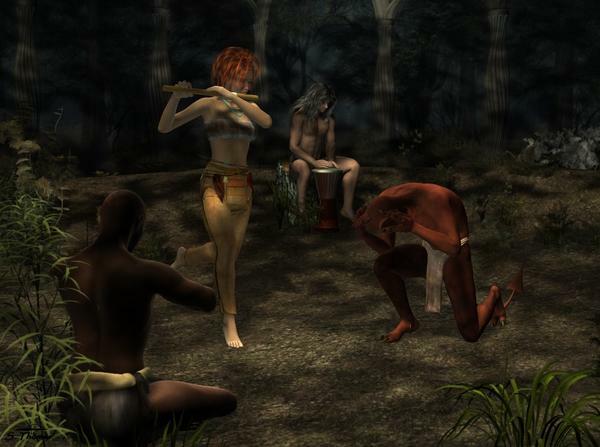 It is for DAZ Studio 4.5 only. The picture features about 7 of the colors. Just tell me and I will set up the files for you. Oh and some nice renders showing up. You guys are really wanting to make it hard for us judges. Got me a Birdland (and learned how to make it talk)! Thanks, Music -- she's a beauty! Now, QUESTION: What outfit are Celebi's entry-gift textures for? It's for the M4 Witch Hunter outfit. Not sure where you get it! Cheers and many thanks to this month's prize donors BWSMAN for the Muscle Car Tribal Texture and SKIPPER25 for the Banker's Lamp. 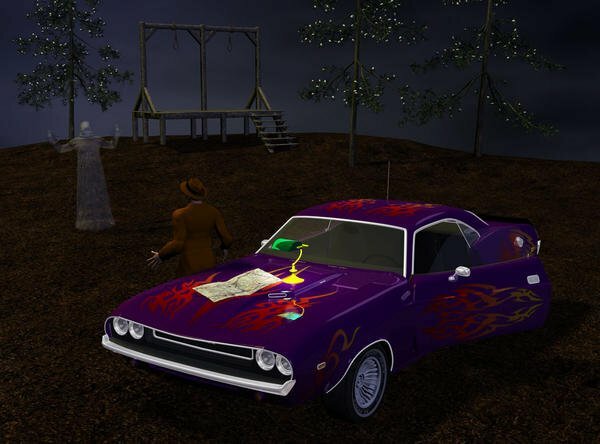 Seen here with Midnightrider's Evil Keeper ghost from his old Frightings site and Trekkiegrrrl's Morphing Newspaper turned into a roadmap, set in the Crying Fields gallows scene by LDDesign, the RuntimeDNA newsletter freebie from October 19. Wow! That Birdland looks really nice! So does the texture for the muscle car! The Birdland will be a prize for the January challenge, to celebrate our 6th anniversary here. Next month is approaching, and I promised Robkelk I would make something to donate as a prize. 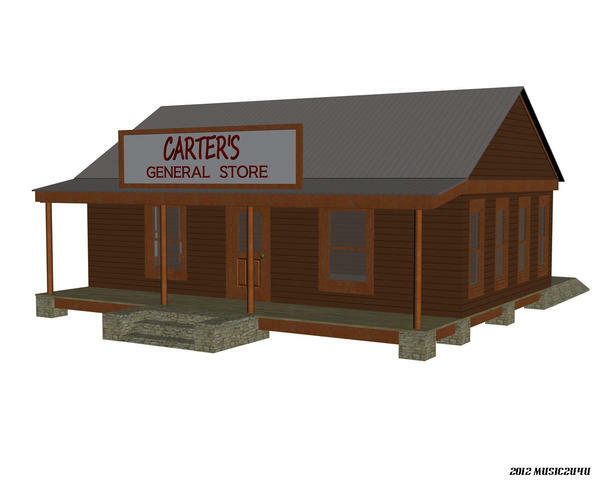 Here is what I made, Carter's old time general store, still a WIP as I will be making the interior throughout the month. It will not be stocked though, you will have to fill the shelves with your own goods. There will be an old time cash register though and a counter, an old pot belly wood burning stove to keep warm in the winter and lots of shelves. In the back is a store room and a meat cooler room inside it. A loading ramp out back, and an outhouse too. The doors open and close for animations. here is a quick peek. That looks cool! There are freebies to fill that store up. 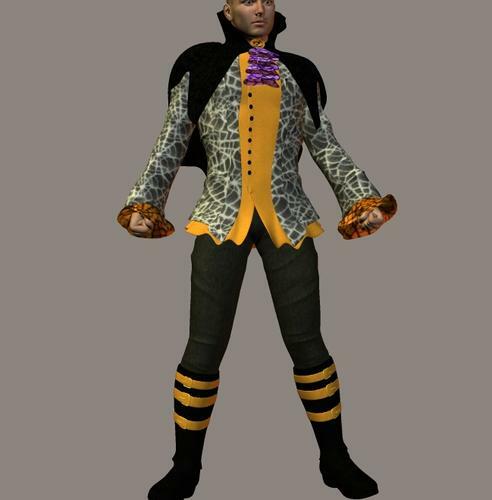 I've seen some, and downloaded some...I can't remember where from right now, but I think Renderosity. Maybe some at ShareCG, too. Yeah, wooden stave barrels and big jars for the counter top would be easy to find. Anyone know where there are fattened grain sacks? ...........and........a great big glass jar of pickled pigs feet!........yuk! Very nice, Music. It makes me want to yell, "Yeeeee-Haw!" 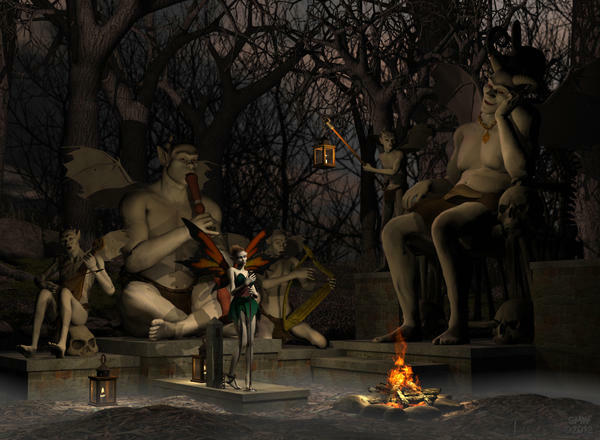 Like I said, I think at Renderosity. It might have been an old west kind of thing, there were grain sacks and jars of different kinds, wagon wheels, stuff like that. That's one of the things I was looking for. I thought it was at Renderosity, but something was nagging at me that it wasn't there. Man did this month go fast. Been bouncing from one thing to the other, but I've finally found time to finish my entry!